A couple of "sticky situations" in the Colossian church bring visitors to Paul in prison. First, an old friend arrives with news that false teachers are belittling Christ, laying down rules, and boasting of secret knowledge beyond the gospel. Then a runaway slave begs Paul to ask his Christian master for mercy. 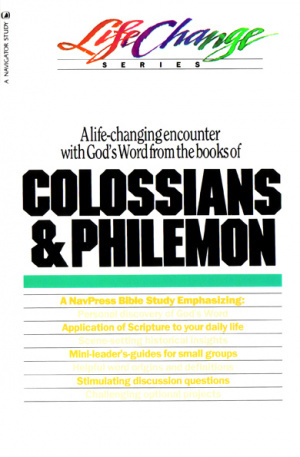 LifeChange Colossians & Philemon (11 Lessons) by Navigators was published by Navpress in June 1988 and is our 37879th best seller. The ISBN for LifeChange Colossians & Philemon (11 Lessons) is 9780891091196. Be the first to review LifeChange Colossians & Philemon (11 Lessons) ! Got a question? No problem! Just click here to ask us about LifeChange Colossians & Philemon (11 Lessons) .